In 2012, I published a large review essay in the journal Istor of several books on the subject of war and public opinion (link here, everything is available for free in PDF). Since it was published there in Spanish but written originally in English, I’ve decided to make the full text available here. Kenneth Osgood and Andrew K. Frank, Selling War in a Media Age: The Presidency and Public Opinion in the American Century, Gainesville: University Press of Florida, 2010. Alan Axelrod, Selling the Great War: The Making of American Propaganda, New York: Palgrave Macmillan, 2009. Hugo García, The Truth about Spain! : Mobilizing British Public Opinion, 1936-1939, Brighton; Portland Or. : Sussex Academic Press, 2010. José Luis Ortiz Garca, Ideas en tormenta: la opinión pública en México y la segunda guerra, Naucalpan: Ediciones Ruz, 2007. Monica Rankin, ¡México, la patria! : Propaganda and Production during World War II, Lincoln: University of Nebraska Press, 2009. James T. Sparrow, Warfare State: World War II Americans and the Age of Big Government, Oxford: Oxford University Press, 2011. Belmonte, Laura. Selling the American Way: U.S. Propaganda and the Cold War, Philadelphia: University of Pennsylvania Press, 2008. If it seems that the last few years have witnessed a mini-boom in the publication of books about war and public opinion, I suspect that is not an illusion. Some of the books, especially those dealing with the United States, seem to have had their origins in the run-up to the war in Iraq that began in 2003. It was a war that was widely considered appalling throughout much of the world, and not merely appalling: next to incomprehensible. Nearly seven in ten Americans had somehow come to believe, seemingly prodded by the intimations and framing of the administration of George W. Bush, that Iraq’s Saddam Hussein had been directly involved in the attacks of September 11, 2001. Few others in the world shared that delusion. Faced with such an apparently successful campaign of misinformation, historians, with all of the urgency they can muster, began to look to past conflicts to examine the history of the relationship between the politics of war and public opinion. Five to seven years later, we have, if not an explanation for what the Bush Administration was able to accomplish with Iraq, then at least some perspective on it. Taken together, the books under review here show us that war has played a central role in the creation of the idea of “public opinion,” and that the concept has been transformed over time by new technologies of measurement and persuasion. But they also caution that the mutations of war are not always predictable, and that “public opinion” is itself an invention whose logic has changed with time. The broadest of the texts under review, Selling War in a Media Age, is an edited volume coordinated by historians Kenneth Osgood and Andrew K. Frank that attempts to offer a comprehensive picture of how presidents sold war to the U.S. public over the course of the twentieth century. The early essay by George C. Herring argues that it was William McKinley (1897-1901) who established the modern form of the U.S. presidency in both his care for public opinion and in pioneering new techniques for directing it. By modern standards, his methods were simple. McKinley read incoming mail to the White House to judge public sentiment. To gain a measure of influence over the press, he offered it special attention, inviting reporters into the White House and selecting the information that he would give to them. These modest attempts to shape the views of the public grew more intense with the clamor for war with Spain in 1898. At first, McKinley attempted to tamp down enthusiasm for war, which was then extremely popular and heavily promoted by the powerful yellow press of the era. Yet once the war began, McKinley shifted his approach, getting approval from Congress for broad powers to end the war in Cuba, imposing censorship on the press and equating dissent with a lack of patriotism. Because the war ended quickly it did not generate much controversy, and McKinley’s greatest challenge—at which he failed with both the public and with Congress—was to build the case for the acquisition of a large, formal overseas empire. (The Platt Amendment which left Cuba a semi-sovereign quasi-dependency of the United States was the result of his failure to acquire it outright.) McKinley may have inaugurated the modern presidency in the United States, but public opinion functioned to set limits to his actions, and remained shaped much more by private groups than by government officials. The public’s apparent appetite for war with Spain was only part of what made the problem of “public opinion” emerge at the turn of the twentieth century. Technologies such as inexpensive telegraphy made rapid communication and global coordination more possible than ever. Expanding ranks of literate citizens, living in cities with newspapers, could learn more about what was happening in foreign affairs in ways that made them newly relevant to politics. At the same time, those new technologies also made possible new forms of mass advertising. Walter Lippman, one of the most important American thinkers on the subject of the new “public opinion,” wrote in 1914 advertising now represented an effort by business to “take charge of consumption as well as production… [not only] to supply a demand […] [but] to educate the demand as well.” Changes in forms of living in the first decades of the twentieth century made it a time for thinking seriously about whether democracy was compatible with these new efforts to shape and manipulate a mass public. Selling the Great War, was born in 1876 in Missouri. Early in his career, he did work writing humorous pieces for the yellow press in Chicago and New York before starting his own newspaper in Kansas City. His paper tried on a few left-wing ideologies before Creel settled into an abiding belief in “Americanism,” the assumption that the American form of democracy was the apotheosis of human political achievement. Nevertheless, Creel became a crusader for progressive causes, writing pamphlets in favor of women’s rights and against child labor. While he concocted many of the details for his work on child labor, Creel generally came to believe that the best propaganda would be based on facts, artfully presented in ways that would convince the broader public to follow along. Creel was not simply a man of ideas; he was also a follower of political personalities. He was an enthusiastic supporter first of Theodore Roosevelt and then of Woodrow Wilson. Identifying with heads of state, Creel came to believe that the management of public opinion was not incompatible with democracy, but essential for its practice. The public did not have the knowledge that would guide it to the right decisions, and so it became the job of the propagandist to make the right information available in ways that would lead the public to follow the enlightened decisions of the government, giving it the public support to be effective. In Creel’s mind, propaganda made it possible to mobilize a public for war without destroying democracy, by creating public support for necessities of state. Fewer than ten days after the U.S. declared war on Germany in April 1917, a Committee on Public Information was created with Creel at its head. Creel described the CPI as an alternative to censorship, although it was more of a companion: harsh laws were enacted to punish those who would publish information useful to the enemy. But Creel thought that flooding the public sphere with information provided by the government and relying on voluntary cooperation of the news media would be sufficient to manage the information that reached the public. The press was given lists of the sorts of things that they should not publish, such as troop and ship movements, but they were compensated by being allowed to embed journalists with troops: as Creel saw it, bringing the press into government service. In an age preceding even commercial radio, the mass media with which Creel and his committee had to work were newspapers, magazines, and silent films. But one of the most important innovations that came from the CPI was the group of so-called “Four-minute men,” thousands of volunteers who spoke in public meetings in favor of the war. From April 1917 to November 1918 they delivered 7,555,190 speeches, largely before movie screenings but also in churches, union halls, social clubs, and so on. Although he appreciated their enthusiasm, Creel grew concerned by the anti-foreign intensity of some of the Four-minute men, and tried to correct their messaging by having them trained along the same lines as door-to-door brush salesmen: he wanted them to sell the benefits of the product rather than the product itself. The benefits of the war was, for Wilson and Creel, paradoxically, a world without war. Creel mixed faith in democracy and the goodness of America with the approach of a businessman, relying on ideas in advertising and sales that were entirely contemporary and intended to feel that they were part of American culture. Creel’s CPI also developed techniques for reaching foreign audiences. It had programs targeted at the publics of the Central Powers, for allied Europe, and for Latin America, especially Mexico, where the principal aim was to counter the influence of German propaganda. In Mexico, theaters had to accept CPI-produced films, where messages were crafted to avoid offending allies, or be cut off entirely from Hollywood supplies. While propaganda to allied nations aimed to make them receptive for President Wilson’s goals for the postwar order, propaganda aimed at the Central Powers was intended to undermine morale. When food became scarce there, the CPI dropped leaflets referred to as “paper bullets” showing images of the plentiful rations of the American soldier. Yet though Creel believed that the management of public opinion was a permanent feature of democracy, he thought of the CPI as a wartime measure, and began dismantling it within twenty-four hours of the cessation of hostilities. Though wartime propaganda is as old as war itself, it is not surprising that the innovation of a public information bureaucracy emerged in the context of a wartime democracy, where new technologies and widespread literacy made mass propaganda possible, and anxieties about the misalignment of elite interests and popular concerns led people like Creel to imagine that there was democratic virtue in the management of opinion by elites. If this vision bore an uncanny resemblance to what Plato described as the ideal form of republican aristocracy—in which the ruling class consisted of those with philosophical truth and “souls of gold” which endowed them to manage the affairs of society in a virtuous and enlightened fashion, this was perhaps because they responded to a similar fantasy of elite rule for the benefit of the common people. That an ideal aristocracy and an existing democracy were being described in roughly the same terms would be one source of criticism of the elite enthusiasm for the management of public opinion in the years to come. But it was also a clue that the new propaganda would be by no means confined to democracies. Creel’s work was well-known to Hitler and Goebbels, who considered it a model. Neither war nor a democratic public were necessary to make mass propaganda attractive. Within the United States, the CPI fascinated and repelled. At the level of ideas, it stirred new thinking on the problem of the public and propaganda. Never was the phrase “public opinion” more popular in the English language than in the years surrounding U.S. participation in World War I. Not everyone, of course, thought that the development of mass propaganda was such a stirring development as did Creel. Walter Lippmann, the author of Public Opinion (1922), had probably wanted Creel’s job, and criticized him from the outside as insufficiently committed to freedom of expression to be entrusted to operate the machinery of censorship. Lippmann came to share Creel’s view that the democratic public required guidance—his famous phrase was “the manufacture of consent”—but wanted to see it done by impartial, technocratic experts advising the government. Lippmann wanted government by statistician and engineer, who would be, like Plato’s souls of gold, “specially trained […] to a wider system of truth.” Others, like liberal philosopher John Dewey, argued the Lippmann should not have given up so easily on the promise of public deliberation and of an educated, engaged citizenry. Still others embraced the apparent power of the new techniques. Edward Bernays, who, in Propaganda (1928), wrote proudly of a public manipulated by an “invisible government” of taste and opinion makers, had been on staff in the Latin American division of CPI. Considered one of the founders of the discipline of public relations, in the 1950s Bernays famously lobbied the U.S. government on behalf of the United Fruit Company to portray the government of Jacobo Arbenz in Guatemala as a Communist threat to U.S. interests, contributing to instigating a CIA-directed coup that overthrew it. Outside of the realm of ideas, and back in the realm of popular politics, Creel’s work represented a concrete rather than an abstract threat. Appointed by the executive, Creel was deeply unpopular with Congress, which kept his budget restricted, seeing in him an unaccountable danger and a potentially dangerous weapon of presidential authority. (Republicans in Congress also didn’t want his CPI to propagandize for Wilson’s planned League of Nations.) In many ways, Creel set the standard for future U.S. propagandists: he had a brief left-wing past, boundless faith in the idea of “America,” the forced optimism of a commercial salesman, and was hated by Congress, in part, for representing both the present and the future in ways that did not, in fact, represent universally shared values or visions within the country. But did his propaganda work? Creel thought it did, or at least said so in his retrospective, How we Advertised America, which he published in 1920 to defend his actions. His critic Lippmann thought so too, saying that public opinion had coalesced into a kind of Rousseauian “general will” during World War I. Emily S. Rosenberg’s essay on World War I in Selling War in a Media Age, however, notes that there remained significant resistance to American participation in the war among rural Americans, especially in the South, as well as in ethnic organizations and some labor unions. Among elites, one needed to look no further than Congress to find critics of Wilson’s plans for war. Rosenberg also observes that if Creel’s propaganda had been more successful, then wartime surveillance might have been less extensive. Finally, she observes that, for as much as public relations had its origins in wartime propaganda, the same advertising techniques were adopted by groups who, in the 1930s, sought to discredit war and advertise peace. Rosenberg’s insight is compatible with much research in political science, which shows that competitive political campaigns generally change few minds, though they often teach people to adjust the intensity of their preferences. This seems to be so not simply because of what no self-respecting political scientist of the present age would describe as the material base determining beliefs in a superstructure of opinion, but also because, in competitive circumstances such a contested election, campaign messages tend to be met with other, equally effective counter-messages. Among the books under review here, the one that does the most justice to this observation is Hugo García’s The Truth about Spain! Of all of the wars under examination, the Spanish Civil War of 1936-1939 has done the most to retain its romance. This has happened in part because of its importance as the great left-wing cause of its era, and in part because, at least outside of Spain itself, its history has been written, contra the general maxim, by its Republican losers, not the Nationalist victors. (And beyond that, because of the considerable sympathies that their anti-Communist story generated in the atmosphere of the Cold War, by the losers of the losers: the independent Marxists and anarchists who were persecuted on the Republican side by the eventually dominant pro-Communist faction.) The conflict was multilayered, the Republican and Nationalist coalitions internally diverse, and both sides counted on an effective foreign policy for their success, all the while the insisting on the essentially Spanish character of their struggle. Franco’s Nationalist side received material support from Fascist Italy and Germany. The Republican government received the material support of the Soviet Union and of the broader worldwide Communist movement in the volunteers of its International Brigades. The Mexican government of Lázaro Cárdenas also assisted the Republic. But it was the powerful Western democracies—Great Britain, France, and the United States—whose intervention might have altered the course of the conflict. Formally, all three were committed to a policy of non-intervention (though France and probably even the United States would violate strict neutrality in secret aid for the Republic when it was already too late). And though it was France where the policy of non-intervention originated, it was Great Britain that became that policy’s greatest champion. 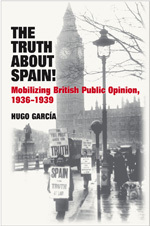 García’s book examines the propaganda efforts of the Republicans to move British public opinion to come to the aid of the Republic, and those of the Nationalists to keep Britain neutral. Both the Republic and the Nationalist side adopted the basic models pioneered in World War I: an authorized office of state propaganda and the imposition of censorship. The offices were intimate: a few officials, a few desks, a few foreign contacts in the right places. Although the Republic retained Madrid, and therefore state foreign press offices and telephone and telegraph infrastructure, and entrusted censorship to the sensitive and intelligent Arturo Barea, foreign journalists found it relatively easy to get candid reports of what was transpiring in the Republican zone through. The Nationalists’ mobile propaganda and censorship office was rudimentary, but banning hostile journalists from reporting from its zone eventually proved effective. Still, the Republic would seem to have had an almost insurmountable propaganda advantage in the intellectuals who supported it and worked to produce Republican propaganda: Pablo Picasso, writers Ilya Ehrenburg and Arthur Koestler, director Luis Buñuel, the photographer Robert Capa, and even the historian Barbara Tuchman. The formidable propaganda apparatus of the Soviet Union at work in Western Europe, consisting of multiple “front” groups, was put at the disposal of the Republic, and, as García shows, the Communist International footed a substantial part of the bill for Spain’s propaganda operations. But this advantage was not so great as it seemed. Contrary to legend, many Spanish intellectuals fled Spain when the conflict erupted and remained effectively neutral in the conflict. Repression by Communists in the Republican ranks created defections of other anti-fascist intellectuals, and even major works, like Picasso’s Guernica, took time to be recognized as masterpieces. More broadly, attempts to enlist intellectuals were part of campaigns to claim the mantle of “Western civilization” against the barbarism of the opponents. In its propaganda, Franco’s side described itself as a national movement against Marxism, on the side of religion, property, and order. The Republic portrayed itself as defending a democratically constituted government against military intervention and as the champion of progress over feudalism, before shifting to the more enduring and apocalyptic message of the defense of democracy against fascism. Each side publicized the atrocities of the other: Nationalists focused on anticlerical murders in the early days of the conflict, while the Republic publicized the relentless murders taking place behind Nationalist lines. Republican propaganda, though necessarily partial and often crude, was, García argues, in the main more honest: it admitted early atrocities from its own side, for example, while trying to stress that they had been stopped. The Nationalists seem to have more frequently resorted to simply making up facts and figures. Perhaps Republican propaganda had some effect. In the end, a solid majority of Britons favored the Republican cause. They did so, however, without the intensity that would have led them to support a change in the policy of non-intervention. Partly this was because the existence of competing Nationalist and Republican narratives made both sides seem less than worthy of the risk of aid. The propaganda landed among a public whose preconceptions of Spain were of general backwardness and barbarism; these impressions may simply have been enhanced by brutal war photography, creating repulsion from war rather than sympathy for one side or another. For the most part, only people on the extremes of British politics felt that the consequences of what was happening in Spain merited intervention. By going beyond a history of propaganda institutions and including its impact, García’s careful and sophisticated book cogently argues that the Spanish Civil War showed that the new propaganda was beginning to prove less consequential than its early practitioners had expected. Still, although the old tendency to describe the Spanish Civil War as a dress rehearsal for World War II shifts attention from the very different coalitions that fought in each, that coming conflict would fundamentally remake the world of propaganda. Mobilization for World War II was so thorough, and the bureaucracies that fought the war so powerful (and so useful!) that they would prove difficult to dismantle. The Cold War that followed provided the state of permanent emergency that served to justify maintaining operations whose use was supposed to be restricted to wartime. But, as three books under review show, the techniques of propaganda were also transformed by the conflict. Both Monica Rankin’s ¡México, la patria!and José Luis Ortiz Garza’s Ideas en tormenta deal with aspects of the Mexican experience of World War II; Jim Sparrow’s Warfare State with the United States. In ¡México, la patria!, Rankin emphasizes the institutional development of U.S. and Mexican propaganda apparatuses. The United States in the era of Franklin D. Roosevelt’s Good Neighbor Policy pioneered new programs for cultural exchange with Latin America, largely in response to Nazi efforts across the continent that preached that Germans and Latin Americans shared a common anti-Americanism. The U.S. countered with a discourse of Pan-Americanism and the idea that the Americas had a common history and destiny. Each of these messages found some sympathetic audiences: at the dawn of World War II, Mexico was internally divided with respect to the world situation and the path forward for its own development. Resistance from U.S. and British oil companies and their governments to the nationalization of Mexico’s oil resources in 1938, for instance, left even the anti-fascist government of Lázaro Cárdenas with a need to negotiate with Germany about oil sales. Both Rankin and Ortiz Garza cover similar territory in describing the communities in Mexican society that were receptive to pro- and anti-fascist messages. The mainstream Mexican press, with its urban and upper-class readership, was accustomed to accepting paid editorial content and in the late 1930s happily took subsidies from German propaganda operations in Mexico to run pro-Nazi materials. The pro-Soviet corners of the Mexican left, such as the artists of the Taller de Gráfica Popular and the unions around Vicente Lombardo Toledano, were the first to produce anti-fascist propaganda, although this was suspended after the signing of the Nazi-Soviet Pact in 1939. There is considerable evidence, however, that the majority of Mexicans, including many in positions of power and authority, looked favorably on a potential Nazi victory at the beginning of the war. We know this because the demands of World War II made the extension of new polling techniques routine—itself an important transformation and the primary subject of Ortiz Garza’s Ideas en tormenta. The first quantitative studies of Mexican public opinion were carried out by polling experts working for the Office of the Coordinator of Inter-American Affairs, the branch of the U.S. government created for the purposes of unifying the hemisphere for wartime. The OCIAA first formed a joint venture with the pioneers of polling in George Gallup’s firm to investigate the media consumption patterns of people from Latin America. They collected the first scientific polling data ever gathered in Latin America in Brazil and Argentina, but the collaboration was short lived. In Mexico, Harald J. Corson, a former employee of Standard Oil in Argentina then working as an expert on public opinion in the OCIAA, began collecting data about the feelings of Mexicans about their position in the world. Early polls, gathered in 1940, must have been troubling for U.S. planners: a survey of the Mexican army showed that 90% considered themselves anti-U.S. and 80% of them as pro-Nazi. Pro-Nazi feelings arose from admiration of “Teutonic discipline,” anti-Communism, and shared anti-Americanism. Corson collected data with increasing sophistication, breaking down responses by the class of those who were interviewed. When he asked : “¿Ha pensado sobre los efectos de que una victoria Nazi tendría sobre usted personalmente?,” in May 1941, 53% of poor Mexicans (versus only 22% of rich ones) thought that a Nazi victory would have positive consequences for them personally. Events would bring changes in those sentiments. When Germany invaded the Soviet Union, the pro-Soviet left in Mexico loudly clamored for a declaration of war against Fascism. New laws against subversion and “social dissolution” targeted Nazi actions in the Mexico. Pro-Nazi material in the mainstream press began to disappear, both because of changing feelings among the readers of the newspapers and because of the actions of Allied propaganda agencies. British and French efforts to combat German propaganda in 1940 had pressured the Mexican government to use its monopoly on subsidized newsprint to get involved in censoring pro-Nazi material. With European budgets strained, the U.S. picked up much of their work, and by the end of 1941, it became almost impossible to find explicitly pro-Nazi news in Mexico. As media technologies changed, they required propaganda offices to work in new forms. Newspapers primarily reached an elite audience, but radio did not require literacy and had the potential to reach a mass audience. Mexico’s most important radio station by far was XEW, owned by Emilio Azcárraga, which had the most powerful radio signal in the Western Hemisphere. Azcárraga’s trajectory, though not the subject of much attention by either Rankin or Ortiz Garza, is broadly suggestive of general trends in the Mexican media. There is evidence that Azcárraga, prior to 1941, contributed financially to Nazi causes and worked to keep British propaganda films out of theaters. But in mid-1941, when German submarines sank Mexican tankers and Mexico drew closer to the Allied cause, the incentives for a businessman like Azcárraga shifted. All of the opportunities were suddenly in cooperation with the United States, and the sophisticated operation for investigating the use of media of the OCIAA could be put to new use. As the data presented in Ortiz Garza shows, as Mexican involvement with the Allies deepened, there was a gradual but steady improvement in views of the United States and the United Kingdom. Though there were many causes for those changes; it was not something that was left to chance. In collaboration with a private advertising agency, for example, the OCIAA collected data on radio use around Mexico. Because of low telephone penetration, people could not simply be called and asked about their habits. OCIAA’s solution to that problem was to purchase several portable radios and hire people to walk the streets of the city. When they heard a radio in use, they tuned the portable radio until the programming matched, marked down the station in question, and gradually generated a thorough portrait of Mexicans’ listening habits. (One such worker is pictured on the cover of this issue of istor; all in all more than one third of all radio sets in Mexico were sampled in the years of research.) The surveys showed the dominance of XEW: it was about four to six times as popular as the next most popular station at all hours of the day. The OCIAA learned more and more about how to provide popular programming as the war went on, using the data to shuffle around its pro-Allied news and variety programs until some of them dominated their time slots. (The Mexican government’s program, the Hora nacional, was broadcast simultaneously on all radio stations and thus had no competition. As we will see, it promoted themes consonant with those of the OCIAA.) By the time the war ended, polling and public opinion research were recognized by the media and private business in Mexico as fundamental tools in understanding and “educating” demand. Neither Rankin nor Ortiz Garza is interested in deep theorizing about the nature of public opinion, and so it seems to me that both might have said more about this fundamental transformation in the understanding of the idea of public opinion. Before it could be quantified, public opinion could only be a kind of mass sentiment understood—or misunderstood, perhaps—at the level of intuition. When it came to be measured, these Rousseau-ean qualities disappeared. Suddenly public opinion was reconfigured into a mass of statistics: from that point onward, public opinion could only be understood—or misunderstood, perhaps—in the language of science. This change was not value-neutral. During the Cold War many left-wing sociologists in Latin America would declare polling a Yankee import that served only to divide the “people.” Polling, of course, did not create diverse views among diverse populations, but it certainly made it more difficult to craft compelling populist narratives about revolutionary transformation. The PRI, at any rate, thought so, and more or less did away with public opinion polling in the 1950s, 1960s, and 1970s. But a new understanding of the nature of public opinion was not the only outcome of Mexico’s participation in World War II. Mexican state propaganda during the war, which was institutionalized in 1941 in the Oficina Federal de Propaganda, hit on several themes. As described by Rankin, its work employed themes of patriotism and national unity and defined good citizenship as hard work in the national spirit. Both Mexican and U.S. propaganda focused on the rhetoric of democracy. (Private businesses echoed government campaigns, crafting popular messages that coincided with the official line. I have seen a magazine ad from 1944—surprisingly effective on me even at 70-odd years remove—for Victoria beer which read: Victoria de las democracias. Victoria de México.) For Rankin, the most significant theme of Mexican wartime propaganda was that of industrialization. That subject papered over some of the differences between left- and right-wing factions within the revolutionary family, and between private business and the state. “Mexico’s weapon is production,” the slogan became, to fit with the form of participation in the Allied cause common to most of Latin America. Industrial modernization seemed like it could solve both national and international problems for Mexico at the same time. For Rankin, World War II becomes the key to explain how the Mexican government transformed a revolution, which had included an attention to the distribution of wealth within the country, to the postwar “Mexican miracle,” focused on increased production. Pushing her argument further, she might have said that the PRI (as opposed to the PNR and PRM that preceded it) was forged in the national and international conjuncture of World War II. That would take a conflict which has been considered relatively marginal to Mexican history and place it squarely at the center. Warfare State: World War II Americans and the Age of Big Government asks many of the same questions about the United States as Monica Rankin’s ¡México, la patria! does of Mexico. How did the transformations of war change the expectations that people had for their lives and for their governments? And how did the state manufacture consent for its priorities in a time of conflict? If for Rankin, the reorientation of revolutionary Mexico to the postwar “miracle” is the puzzle that needs to be explained, for Sparrow it is the remarkable acquiescence of a dominantly anti-statist political culture to the dramatic expansion of the powers of the federal government. Sparrow argues that U.S. citizens came to incorporate the messages that both government and private business were using to articulate a form of ideal citizenship in the image of the combat soldier. Making the soldier the center of the national project made a form of nationalist, militaristic, yet social democratic egalitarianism possible—and with it an expansion of the powers of the government far beyond what the New Deal had ever offered, and with far less controversy. The inclusion of racial minorities, especially African- and Mexican-Americans in combat service provided a platform on which they could assert equal citizenship in the postwar period—though it would take a generation of activism to begin to realize that promise. Far more than most of the other texts under review, Sparrow’s deeply-researched text goes beyond presidential and institutional history and into the social history of institutions. Some of his most interesting sources were the products of sophisticated research that different branches of the U.S. government performed on its own people. Most relevant to the review here, this data generally shows the limits of state propaganda to influence its intended audience. The state, preparing for total war, needed to manage the morale of both citizen and soldier. The Roosevelt administration drew on the cultural and educational programs of the New Deal, repurposed with new messages. This required changes from the implicit compact of the New Deal. Big business, the villains of much New Deal rhetoric, was (as in Mexico) equated with production, and production with heroism. Some programs cherished by New Deal liberals, like efforts to inspire patriotism by collecting folk music (the music “of the people”) fell flat when it was discovered that soldiers didn’t care for the music. Messaging for war, as ever, required both the production of information and the surveillance of the population. The FBI investigated and catalogued rumors which bubbled up from people seeking explanations for transformations beyond their control. Many rumors drew on popular prejudices: in the North, rumors of Jewish conspiracies and draft avoidance proliferated. In the South, where the war economy made the African-American labor more expensive, gossip blamed northern agitators for racial tensions. And in the West, some snarled that the Japanese, confined to concentration camps, ate better than anyone else. The government tried to use “rumor clinics” to counter the accusations that some groups were receiving preferential treatment, and therefore not making the same sacrifices as others in the context of war, but found that “debunking” was counterproductive. A study of radio programming showed that trying to debunk a rumor actually led to more people believing the falsehood. Sparrow argues that bringing rumor into the legitimate attention of government strengthened the national security bureaucracy at the expense of other parts of the government, helping to lay the ground for the centrality of surveillance to governance during the Cold War. Propaganda’s power was limited, but the social transformations of wartime affected every American. The economy grew rapidly; demand for labor meant incomes grew at a healthy clip. Inequality shrank – income tax rates were as progressive as they ever would be – almost 70% for incomes over $100,000 and 90% above a million dollars. (In 1942, Roosevelt even proposed a 100% tax rate for incomes above $25,000 as a way of ensuring more equal sacrifice and preventing war profiteering. It was popular but never enacted.) But as the economy expanded, so did the tax base. Only about 7% of the labor force had paid federal income tax as late as 1939, but by the end of the war the obligation would extend down even into the working class. Tax collection relied largely on voluntary cooperation, and people had to be educated both in how to do it, and why doing so was a democratic duty. Beyond taxes, the majority of American households purchased war bonds, casting the actions in similar terms. Studies showed that people bought bonds for reasons that independent of the government’s messages, but they bought them anyway, whether from guilt, competition, or even, occasionally, profit. Selling the American Way is the latest in a series of books to examine U.S. Cold War propaganda strategies and sites. Belmonte looks specifically at the United States Information Agency, a civilian propaganda bureau established in 1953 to do “public diplomacy” outside of the United States, though a bureau also with an important prehistory. One of the key architects of U.S. Cold War “public diplomacy” was William Benton, an ad magnate who had made a fortune during the Depression and “retired” in his thirties to the vice-presidency of the University of Chicago. (In 1943 he took over as publisher of the Encyclopedia Britannica.) Like George Creel in a different era, Benton was an idealist. A bit “pink” by the standards of the late 1940s, Benton was sympathetic to the idea of a world government, thought that war was created by misunderstanding, and that the people of the world could be brought together through cultural interchange. Like Creel, Benton believed that the truth was the best form of propaganda. He drew a distinction not available to Creel between totalitarian “propaganda,” the purpose of which was to conceal and mislead, and democratic “information,” which was honest. In the immediate aftermath of the war, “information” services were under State Department control, and Benton, serving as assistant secretary of state for public affairs in the Truman administration, was responsible for defending information programs before a skeptical Congress. As they had been during World War I, conservatives in Congress were the greatest enemies of U.S. public diplomacy. Allocating federal funds to project an image of the country created all sorts of conflicts, as representatives from different parts of the country and with different ideologies, did not value the same characteristics of American society. Benton did not want to shy away from presenting problems in American life, including, most obviously, racism. Many in Congress, however, objected to what they saw as the use of taxpayer dollars to insult the United States. Similarly, to counteract stereotypes of capitalism in the United States as under the control of ruthless monopolists and plutocrats, information professionals wanted to champion features of U.S. law such as anti-trust regulations. But this too led conservatives in Congress to believe that U.S. information programs abroad promoted the New Deal and liberal internationalism. Why were federal funds being spent to give the U.S. a bad name? In 1946 Congress cut Benton’s budget to a minimum. The greatest controversy of Benton’s tenure arrived that fall, when he announced that the State Department would sponsor a tour of experimental and abstract paintings known as “Advancing American Art.” The exhibit was intended especially for exhibition in Europe, where it was intended to challenge stereotypes held by both conservatives and the left that the United States was culturally backward and derivative. It was among the first attempts to use abstract art as a representation of American creativity and “freedom”—such works could not have been produced under totalitarianism—even though many of the artists saw themselves as critical of postwar conformism in U.S. society. Still, the traveling show was a success: it was so popular in Prague that the Soviet Union felt compelled to send in a dueling exhibition of socialist realist art. At home, however, the exhibit generated a firestorm of controversy. American conservatives favored representational works that created a positive image of the nation and that could be easily understood by the public. Abstract expressionism did none of that, and so it was called communist-inspired and un-American by conservatives in Congress. Ironically, of course, the official socialist realism of Communism used basically the same criteria to judge the worthiness of art as did American conservatives. (So much so that Benton, many years later, would accidentally make one of the most insightful comments about the similar tastes of conservative collectors of Americana and of Soviet bureaucrats when he recommend to the Sears Roebuck company that it sell Soviet paintings through its mail-order catalogs, observing that the “Soviet tradition of Socialist realism is very much in the spirit of the kind of paintings which will prove popular with Sears, Roebuck customers.”) But in 1946, the attack on “Advancing American Art” was enough to derail it. The Secretary of State had to promise that no more tax money would be used on modern art. Benton was appointed to a seat in Congress for a brief period, and then became the U.S. ambassador Unesco, where he hoped would take on the qualities of world government to end war “in the minds of men.” It was a hope, but not an idea. One more anecdote from the Eisenhower era will suffice to bring an end to our discussion of the books under review. U.S. information agencies operated lending libraries in many cities around the world, where foreigners could come to learn about the U.S. through its books. (Mail-order catalogs were among the most popular items – people would sometimes flip through them in astonishment at the affluence that they implied.) At the height of McCarthyist demagoguery, in 1952, McCarthy accused those libraries of carrying books by Communists and fellow travelers. Secretary of State Dulles ordered cooperation with McCarthy’s “investigations” and agreed that such books should not on the shelves. But who counted as a fellow traveler? In the absence of guidance, a few panicked caretakers pulled material from the shelves; a handful of books were even burned. Noted nineteenth-century fellow traveler of the Soviet Union Henry David Thoreau was among those authors eventually banned, as were Ernest Hemingway and Mark Twain. President Eisenhower, speaking to students at Dartmouth College, urged them not to “join the book burners,” which seemed to set him apart from McCarthy. But privately, he ordered the retention of the prohibition on books “persuasive of Communism.” Though the number of books actually burned was tiny, the episode was sufficiently redolent of Nazi actions that it seemed to say more about the political culture in the United States than all of the books that remained on the library shelves. So where does this all leave us? Perhaps we should end where we began, with the premise that inspired at least a few of the books under review here: the idea that the Bush Administration’s handling of the Iraq war was a masterful piece of propaganda that required explanation. The premise, as it happens, is false. Careful examination of public opinion data reveals that during the period of the Bush Administration’s push for war, support for invasion actually decreased. Nor was the false link between Saddam Hussein and the attacks of 9/11 merely a product of administration and media propaganda. Immediately after the attacks, Americans overwhelmingly held Hussein responsible, before administration efforts to direct opinion in that direction. The percentage of Americans believing the fiction decreased slowly from October 2001 forward. It seems possible that it could have decreased much more quickly if Bush had not done so much to muddy the waters, but it remains the case that the Bush Administration was not able to create a false opinion: at best, it sustained one that already existed. Furthermore, public support for the war proved ephemeral. When the U.S. invasion of Iraq uncovered none of the promised weapons of mass destruction, and the loss of lives and resources mounted, new opinions emerged. By 2006, about a third of Americans believed that the Bush Administration itself was at least partially responsible for the attacks on 9/11. So did many in other countries. Surveys from 2008 estimated that 30% of Mexican blamed the U.S. for those attacks, as did 36% of Turks and 23% of Germans. 43% of Egyptians blamed Israel. These figures are not compatible with the portrait of an administration skilled in the arts of persuasion, pulling on the strings that control U.S. and world opinion. One media relations official in the State Department resigned in 2007, saying that he was weary of trying to convince others that the United States “should not be judged by our actions, only our words.” The Bush Administration set out to convince its citizens and the world of one thing, and it ended by convincing them of something altogether different: its own mendacity. Dana Milbank and Claudia Deane, “Hussein Link to 9/11 Lingers in Many Minds,” Washington Post, 6 September 2003. Walter Lippmann, Drift and Mastery: An Attempt to Diagnose the Current Unrest, (Madison: University of Wisconsin Press, 1985), 52. Data from Google Ngrams, which analyzes the frequency of the use of words and phrases, shows that “public opinion” was most commonly used in the twentieth century, relative to other words, around 1920. This, of course, refers only to printed language. http://books.google.com/ngrams/graph?content=public+opinion&year_start=1900&year_end=2000&corpus=0&smoothing=3, accessed 24 January 2012. Walter Lippmann, Public Opinion (New York: Free Press, 1965), 233–234. John Dewey, The Public and its Problems(New York: H. Holt and Company, 1927). George Creel, How we Advertised America: The First Telling of the Amazing Story of the Committee on Public Information that Carried the Gospel of Americanism to Every Corner of the Globe (New York: Harper & Brothers, 1920). Kenneth Osgood and Frank, Andrew K., Selling War in a Media Age: The Presidency and Public Opinion in the American Century(Gainesville: University Press of Florida, 2010), 54–55, 62–63. A good introduction to this complicated literature is Henry E. Brady and Richard Johnston, eds., Capturing Campaign Effects (Ann Arbor: University of Michigan Press, 2006). Dominic Tierney, FDR and the Spanish Civil War: Neutrality and Commitment in the Struggle that Divided America, American Encounters/Global Interactions (Durham: Duke University Press, 2007). José Luis Ortiz Garza’s Ideas en tormenta has already been given an outstanding review by Pedro Cobo Pulido previously in istor 33 (verano 2008), 160-163. Document 170, May 1940, in “Informes confidenciales encuadernados en inglés, originales III (1940-1942), Eduardo Villaseñor papers, Archivo de El Colegio de México. Others on the left thought polling a perfectly legitimate and valuable activity: see “Alejandro Moreno and Manuel Sánchez-Castro, “A Lost Decade? László Radványi and the Origins of Public Opinion Research in Mexico, 1941–1952,” International Journal of Public Opinion Research 21, no. 1 (March 20, 2009): 3–24. This article documents public opinion research activities in Mexico in the 1940s and the role played by Hungarian professor László Radványi, who immigrated to that country at the height of World War II. Our research relies on several of Radványi’s publications archived in different countries, as well as on interviews with family, acquaintances, and experts on the work of his wife, the German poet Anna Seghers. During his years in Mexico, Radványi founded the Scientific Institute of Mexican Public Opinion, in 1941, and the International Journal of Opinion and Attitude Research, in 1947—a forefather of today’s IJPOR. He was also a founding member of WAPOR. His early “sample surveys” raised important methodological issues and recorded opinion results that reflect the vibrant times of war and policy making in a modernizing country. However, Radványi’s contribution to the profession has been virtually forgotten. Until now, accounts about how public opinion research began in Mexico either ignored Radványi’s works or reduced his ten years of survey research to a single footnote. This article is an attempt to fill this enormous omission and highlight some of Radványi’s contributions to these early stages of survey research. The magazine was Así, which also carried an advertisement for a furniture store that showed bombs raining down on furniture with text reading “Estamos en Guerra – contra los precios altos!” I found it less moving. William Benton to J. William Fulbright, 29 March 1965, William Benton papers, box 391, folder 2, University of Chicago Special Collections Research Center. Thomas W. Braden, “I’m glad the CIA is ‘Immoral’,” Saturday Evening Post 240, no. 10 (20 May 1967), 10. Gary C. Jacobson, A Divider, not a Uniter: George W. Bush and the American People (New York: Pearson Longman, 2007), 127, 132; Scott L. Althaus and Devon M. Largio, “When Osama Became Saddam: Origins and Consequences of the Change in America’s Public Enemy #1,” PS: Political Science & Politics (October 2004): 795–799. “Who was behind 9/11?,” September 10, 2008, http://www.worldpublicopinion.org/pipa/pdf/sep08/WPO_911_Sep08_quaire.pdf, accessed September 7, 2011. Fred Kaplan, “Bush’s Failed Campaign to Rebrand America,” 30 May 2007, http://www.slate.com/articles/news_and_politics/war_stories/2007/05/bushs_failed_campaign_to_rebrand_america.html, accessed 23 January 2012.